The resolution of conventional optical microscopy is limited by the fundamental physical principle of diffraction to about one-half of the wavelength of the light: If the distance between two objects is smaller than this so-called "diffraction limit," they can no longer be visually separated—the image appears "blurred." To acquire optical images at the scale of few nanometers, this is clearly not sufficient. For this reason, scientists worldwide have developed elaborate techniques to circumvent the diffraction limit and thus to increase the resolution. However, the technical effort needed to do so is considerable, and highly specialized microscope assemblies are usually required. In particular, the investigation of optical near fields still represents a great challenge, because they are so strongly localized that they cannot send waves to a distant detector. In a new study, physicists from the Julius-Maximilians-Universität Würzburg (JMU) and the Technische Universität Dresden now show that it is possible to measure these near fields with significantly less effort. They used a biomolecular transport system to slide many extremely small optical nano-probes over a surface. They present their results in the current issue of the renowned journal Nature Nanotechnology. "As probes, we used so-called quantum dots—small fluorescent particles a few nanometers in size," says Professor Bert Hecht at the JMU; he jointly supervised the project with Professor Stefan Diez of TU Dresden. So-called motor proteins and microtubules make the quantum dots pass over the object to be examined. "These two elements are among the fundamental components of an intracellular transport system," explains Diez. "Microtubules are tubular protein complexes up to several tenths of millimeters long, which form a major network of transport routes inside cells. Motor proteins run along these routes, transporting intracellular loads from one place to another," says Hecht. The physicists took advantage of this concept, but in reverse order: "The motor proteins are fixed to the sample surface and pass the microtubules over them—a kind of 'stage-diving' with biomolecules," says Heiko Groß, Ph.D. student in the Hecht group. The quantum dots serving as optical probes are attached to the microtubules and move together with their carrier. Since a single quantum dot would take a very long time to scan a large surface area, the researchers used large amounts of quantum dots and motor proteins, which move at the same time, and thus scan a large area in a short time. "Using this principle, we can measure local light fields over a large area with a resolution of less than five nanometers using a setup that resembles a classical optical microscope," explains the physicist. By comparison, one nanometer equals one millionth of a millimeter. The physicists tested their method on a thin layer of gold with narrow slits less than 250 nanometers wide. These slots were illuminated from below with blue laser light. "Light passing through these narrow gaps is limited to the gap width, making it ideal for demonstrating high-resolution optical microscopy," says Gross. During the measurement, a "swarm of microtubules" simultaneously glides in different directions across the surface of the gold layer. Using a camera, the position of each transported quantum dot can be exactly determined at defined time intervals. If a quantum dot moves through the optical near-field of a slit, it lights up more strongly and therefore acts as optical sensor. Since the diameter of the quantum dot is only a few nanometers, the light distribution within the slot can be determined extremely precisely, thus circumventing the diffraction limit. Another nice feature of this approach is that due to its length and strength, a microtubule moves in an extremely straight and predictable fashion across the motor-coated sample surface. "This makes it possible to determine the position of the quantum dots 10 times more accurately than with previously established high-resolution microscopy methods," explains Dr. med. Jens Ehrig, former postdoctoral fellow in the Diez group and current head of the "Molecular Imaging and Manipulation" facility at the Center for Molecular and Cellular Bioengineering (CMCB) of the TU Dresden. Furthermore, disturbances caused by artifacts due to near-field coupling can be excluded. Since the transport system consists of only a few molecules, its influence on the optical near fields is negligible. The researchers hope to use their idea to establish a new technology in the field of surface microscopy. In any case, they are convinced that this type of microscopy has applications in the optical inspection of nanostructured surfaces. 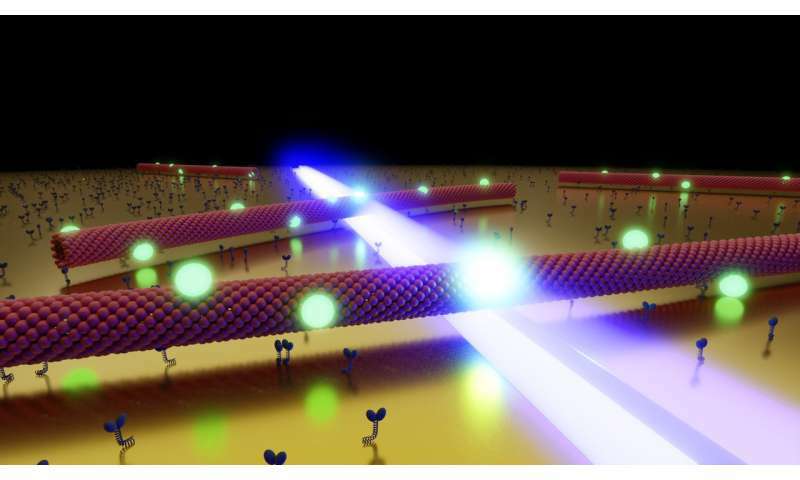 In a next step, the researchers want to use this molecular transport system to couple quantum dots to specifically prepared optical near-field resonators to study their interaction.